A lymphocele, in basic terms, is a cystic cavity containing lymphatic fluid, with a fibrous (not epithelial lined) capsule. Most prostatectomies are now being done with concomitant lymphadenectomy. A few factors are responsible. First, urologists are increasingly comfortable offering active surveillance for very-low-risk and most low-risk prostate cancers, all but removing them from the surgical realm. In a National Cancer Database study, 70% of prostatectomies were accompanied by pelvic lymph node dissection (PLND) in 2010–2011,1 and we suspect this number has only risen since. Second, mounting data indicate that staging is improved with extended PLND (ePLND). It stands to reason that we now have renewed interest in assessing why lymphoceles seem to be an almost inevitable consequence of lymph node removal, uncovering the putative risk factors, and determining how they can be prevented. A lymphocele, in basic terms, is a cystic cavity containing lymphatic fluid, with a fibrous (not epithelial lined) capsule. It was first described using the term “lymphocyst” after a series of hysterectomies for cervical cancer by Mori in 19552. No official categorization system or severity grading system exists for post-surgical lymphoceles, but some people describe them by denoting how the diagnosis was made, either prompted by symptom-driven investigation (clinical) or incidental on abdominopelvic radiographic exam (radiographic/subclinical). The exact mechanism of lymphocele formation after either transperitoneal or extraperitoneal prostatectomy with lymphadenectomy is largely speculative. Unsealed lymph channels allow for ongoing lymphorrhea that accumulates into a surgical space. Some collections ultimately resorb spontaneously. Peritoneum allows free absorption of lymph, so for persistent lymphoceles, the fluid cavity must be excluded or walled-off from the peritoneal cavity. In an extraperitoneal approach, exclusion from the peritoneum is easy to conceive, but is perhaps less obvious following a transperitoneal approach. 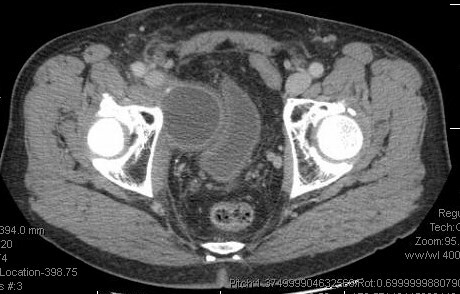 Pelvic lymphoceles are rare following radical cystectomy with lymphadenectomy. This suggests the bladder plays a key role in walling off lymphocele cavities following prostatectomy. Indeed, the bladder usually forms the medial wall of a pelvic lymphocele cavity (figure 1). Standard vs extended lymphadenectomy. The impact of lymphadenectomy extent has been studied. Interestingly, even when lymphadenectomy is omitted, the lymphocele rate is not zero,8 perhaps because even by mobilizing the bladder and defatting the anterior surface of prostate, lymphatic channels may be disrupted, though this is pure speculation. A standard PLND (sPLND) includes nodes bounded by the common iliac artery superiorly, external iliac vein laterally, node of Cloquet inferiorly, and the obturator nerve posteriorly.9 An ePLND extends the lateral border to the genitofemoral nerve, medially to the bladder wall and ureter, and includes the internal iliac nodes, including tissue below the obturator nerve.9 One might expect that the more lymphatic channels transgressed over a larger lymphadenectomy template, the greater the likelihood of lymphocele formation. This remains controversial, however. Trans vs extraperitoneal prostatectomy. A randomized trial comparing transperitoneal and extraperitoneal prostatectomy would be required to definitively settle the question as to which has a higher lymphocele rate. One intuitively expects the rate to be lower with a transperitoneal approach, but the lymphadenectomy cavity can still become walled off, typically by the bladder, as described earlier. Retrospective propensity matched analysis such as one by Horovitz and colleagues18 examined 3183 RARPs by a single surgeon, with 671 in each group. Symptomatic lymphocele rates between the group were statistically similar: 2.83% after extraperitoneal and 1.49% after transperitoneal. Low event rates may hamper definitive conclusions. For those favoring an extraperitoneal approach to prostatectomy, making a large fenestration in the peritoneum at the end of a case may reduce the incidence of lymphocele formation. Stolzenburg et al compared 50 patients with and without this technique and found a 32% lymphocele rate in patients without a fenestration compared with a 6% rate with fenestration.25 Why this linear fenestration does not rapidly seal over shortly postoperatively is difficult to conceptualize. Virtually all types of hemostatic agents have been used in attempts to prevent lymphocele formation. In a study by Waldert et al, 32 patients had Floseal applied to the lymphadenectomy bed and 110 patients did not.26 The incidence of symptomatic lymphoceles decreased from 14.5% to 3.1% in favor of FloSeal®. Similarly lower lymphocele incidence has been found after TachoSil® application.27 Authors generally hypothesize that a fibrin clot may be formed, reducing lymphorrhea. We hypothesize some sort of local sclerosant effect, akin to sclerosing of the pleural cavity or hydrocele sac whereby a hemostatic agent inflames and subsequently obliterates the potential cystic cavity, thus preventing lymphocele formation. David Canes, MD, of the Lahey Institute of Urology at Lahey Hospital & Medical Center in Burlington, MA. Alireza Moinzadeh, MD, of the Lahey Institute of Urology at Lahey Hospital & Medical Center in Burlington, MA. 1. Wang EH, Yu JB, Gross CP, et al. Variation in pelvic lymph node dissection among patients undergoing radical prostatectomy by hospital characteristics and surgical approach: results from the National Cancer Database. J Urol. 2015;193:820-825. 2. Mori N. Clinical and experimental studies on the so-called lymphocyst which develops after radical hysterectomy in cancer of the uterine cervix. J Jpn Obstet Gynecol Soc. 1955;2:178-203. 3. Lee HJ, Kane CJ. How to minimize lymphoceles and treat clinically symptomatic lymphoceles after radical prostatectomy. Curr Urol Rep. 2014;15:445. 4. Orvieto MA, Coelho RF, Chauhan S, et al. Incidence of lymphoceles after robot-assisted pelvic lymph node dissection. BJU Int. 2011;108:1185-1190. 5. Solberg A, Angelsen A, Bergan U, et al. Frequency of lymphoceles after open and laparoscopic pelvic lymph node dissection in patients with prostate cancer. Scand J Urol Nephrol. 2003;37:218-221. 6. Gotto GT, Yunis LH, Guillonneau B, et al. Predictors of symptomatic lymphocele after radical prostatectomy and bilateral pelvic lymph node dissection. Int J Urol. 2011;18:291-296. 7. Fallick ML, Long JP. Laparoscopic marsupialization of lymphocele after laparoscopic lymph node dissection. J Endourol. 1996;10:533-534. 8. Khoder WY, Trottmann M, Buchner A, et al. Risk factors for pelvic lymphoceles post-radical prostatectomy. Int J Urol. 2011;18:638-643. 9. Naselli A, Andreatta R, Introini C, et al. Predictors of symptomatic lymphocele after lymph node excision and radical prostatectomy. Urology. 2010;75:630-635. 10. Briganti A, Chun FK, Salonia A, et al. Complications and other surgical outcomes associated with extended pelvic lymphadenectomy in men with localized prostate cancer. Eur Urol. 2006;50:1006-1013. 11. Liss MA, Palazzi K, Stroup SP, et al. Outcomes and complications of pelvic lymph node dissection during robotic-assisted radical prostatectomy. World J Urol. 2013;31:481-488. 12. Yuh BE, Ruel NH, Mejia R, et al. Standardized comparison of robot-assisted limited and extended pelvic lymphadenectomy for prostate cancer. BJU Int. 2013;112:81-88. 13. Tomic R, Granfors T, Sjödin JG, Ohberg L. Lymph leakage after staging pelvic lymphadenectomy for prostatic carcinoma with and without heparin prophylaxis. Scand J Urol Nephrol. 1994;28:273-275. 14. Bigg SW, Catalona WJ. Prophylactic mini-dose heparin in patients undergoing radical retropubic prostatectomy. A prospective trial. Urology.1992;39:309-313. 15. Sieber PR, Rommel FM, Agusta VE, et al. Is heparin contraindicated in pelvic lymphadenectomy and radical prostatectomy? J Urol. 1997;158(3 Pt 1):869-871. 16. Chalmers DJ, Scarpato KR, Staff I, et al. Does heparin prophylaxis reduce the risk of venous thromboembolism in patients undergoing robot-assisted prostatectomy? J Endourol. 2013;27:800-803. 17. Capitanio U, Pellucchi F, Gallina A, et al. How can we predict lymphorrhoea and clinically significant lymphocoeles after radical prostatectomy and pelvic lymphadenectomy? Clinical implications. BJU Int. 2011;107:1095-1101. 18. Horovitz D, Lu X, Feng C, et al. Rate of symptomatic lymphocele formation after extraperitoneal vs transperitoneal robot-assisted radical prostatectomy and bilateral pelvic lymphadenectomy. J Endourol. 2017;31:1037-1043. 19. Danuser H, Di Pierro GB, Stucki P, Mattei A. Extended pelvic lymphadenectomy and various radical prostatectomy techniques: is pelvic drainage necessary? BJU Int. 2013;111:963-969. 20. Gotto GT, Yunis LH, Guillonneau B, et al. Predictors of symptomatic lymphocele after radical prostatectomy and bilateral pelvic lymph node dissection. Int J Urol. 2011;18:291-296. 21. Canes D, Cohen MS, Tuerk IA. Laparoscopic radical prostatectomy: omitting a pelvic drain. Int Braz J Urol. 2008;34:151-158. 23. Stolzenburg JU, Kyriazis I, Liatsikos E. Postoperative lymphocele formation after pelvic lymph node dissection at the time of radical prostatectomy should not be considered an inevitable consequence of the approach. Eur Urol. 2017;71:159-160. 24. Davis JW, Shah JB, Achim M. Robot-assisted extended pelvic lymph node dissection (PLND) at the time of radical prostatectomy (RP): a video-based illustration of technique, results, and unmet patient selection needs. BJU Int. 2011;108(6 Pt 2):993-998. 25. Stolzenburg JU, Wasserscheid J, Rabenalt R, et al. Reduction in incidence of lymphocele following extraperitoneal radical prostatectomy and pelvic lymph node dissection by bilateral peritoneal fenestration. World J Urol. 2008;26:581-586. 26. Waldert M, Remzi M, Klatte T, Klingler HC. FloSeal reduces the incidence of lymphoceles after lymphadenectomies in laparoscopic and robot-assisted extraperitoneal radical prostatectomy. J Endourol. 2011;25:969-973. 27. Simonato A, Varca V, Esposito M, et al. The use of a surgical patch in the prevention of lymphoceles after extraperitoneal pelvic lymphadenectomy for prostate cancer: a randomized prospective pilot study. J Urol. 2009;182:2285-2290. 28. Lebeis C, Canes D, Sorcini A, Moinzadeh A. Novel technique prevents lymphoceles after transperitoneal robotic-assisted pelvic lymph node dissection: Peritoneal flap interposition. Urology. 2015;85:1505-1509.